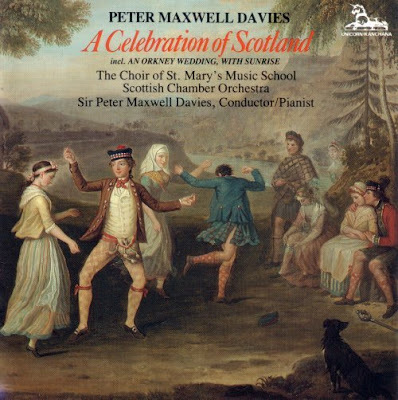 Many people think of Peter Maxwell Davies as a Scottish composer, but in fact he was born in Salford in Lancashire. And I'm adding to the confusion by featuring a CD of his music titled A Celebration of Scotland for the simple reason that it contains some of the most beautiful music ever captured on disc. The riches are too many to list. But for starters try the haunting Farewell to Stromness and Yesnaby Ground for solo piano played by Max, the ravishing Lullabye for Lucy sung by the Choir of St. Mary's Music School, Edinburgh, and the extrovert An Orkney Wedding with Sunrise complete with George McIlwham playing the highland bagpipes. Originally released as a Unicorn-Kanchana vinyl LP in 1988, A Celebration of Scotland was captured in stunning sound in the Queen's Hall, Edinburgh by recording engineer Antony Howell. It, thankfully, remains available as a CD, snap it up while you can. And this post brings a neat symmetry to the path as we are off to Scotland (where we lived for six years in the 1980s) after hearing Jordi Savall and Rolf Lislevand in this evening's Snape Prom. So I'll be celebrating Scotland (and Sufism at the Edinburgh Festival) instead of blogging for a few days. More on Scottish musical connections in Farewell to Stromness.